Ullhaul Trailers offers a variety of different options that enables you to tailor your trailer around your specific needs. If you don't see an option that you are looking for, please inquire because chances are we will be able to accommodate you. Most options that other trailer manufacturers offer come as standard equipment on our basic Three Car - Tandem Axle, and all options below merely add that much more to what is already a GREAT TRAILER. To learn more about these great plans please contact us and we will be glad to go over all options available to you. 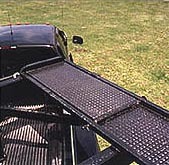 If you want to get the most out of your investment we recommend that you have a pair of ramp extensions installed, they are easy to use and increase the overall hauling capacity of your trailer. The extensions go from their prone position in (fig. 1) to the extended position in (fig. 2) in a matter of minutes. If desired extensions can be left in the extended position even when your not hauling a load. 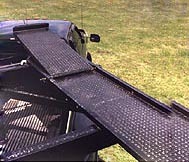 Ramp Extensions will enable you to haul up to three full sized extended cab pickups, and our patented five degree load angle will prevent wind drag from slowing you down. 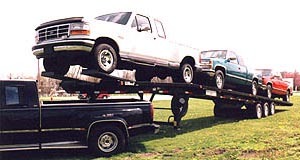 How many other car haulers have you seen with the versatility of the Ullhaul?